Almost 20 years after retiring from her job as a primary school teacher, Mrs Charan Singh remains as busy as ever, running marathons, climbing mountains, volunteering and acting. 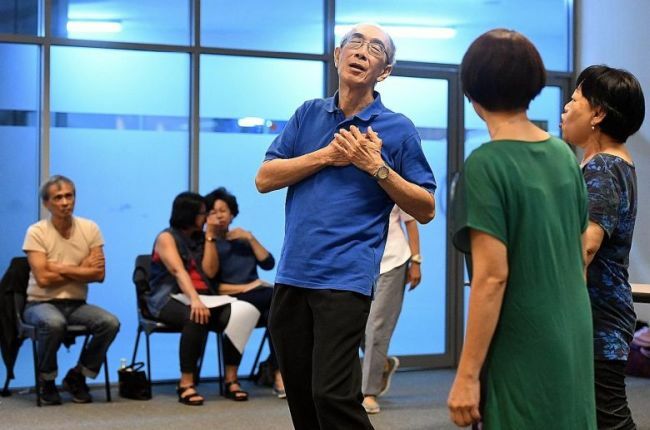 For the past three months, the 79-year-old has been at Marine Parade Community Club twice a week - for two hours each time - rehearsing for an upcoming theatre production. She is part of an acting troupe called Ageless Theatre, which she joined in 2012. It is a non-profit interest group managed and run almost entirely by seniors from all over Singapore. Since its inception in 2011, the group has written, directed and performed in seven major productions in various locations, including The Arts House and Gateway Theatre's Black Box. "Being part of a theatre group is a dream come true for me. Since I was young, I have been quite interested in being on stage and performing plays," said Mrs Singh. "But I came from a very strict family with old-fashioned values, so I could not pursue it. It was only after my retirement that I got to try my hand at acting." Ageless Theatre is made up of mostly semi-retirees and retirees in their 50s and 60s. The oldest member is aged 82. The group started accepting younger talents last year, with the youngest recruit now being a 30-year-old. From scriptwriting to acting and directing, the 25-strong team handles everything that a regular theatre group does. For many of its members, the group is also a source of companionship. "All of us love to act and be on stage," said group chairman June Goh. The semi-retiree, who is also a coordinator at pro-family initiative Family Matters, added: "We are like a family. We help one another improve and memorise scripts and we motivate ourselves. We share our stories with one another." The 61-year-old said members have a WhatsApp chat group which they use to organise activities and keep one another updated about the theatre group's progress. The oldest member, Madam Tan Ah Moi, 82, does not speak English, but that does not stop her from joining in the sessions. Since 2011, the housewife has been playing various roles onstage, some involving the Hokkien dialect which she is fluent in. "I started theatre in my 70s. Here, I am always learning new theatre skills," she said. "Memorising scripts helps keep my mind active. Many of us are old but we do not have dementia; we keep our minds active." She added: "Many times I have thought that I might want to step back because of my age, but when I think of the friends I have made here, it keeps me going." Ageless Theatre makes it a point to weave messages that address social issues concerning elderly people into its plays. These include topics such as loneliness and isolation, as well as seniors finding love in their twilight years. In 2017, the group put together a play called Surrender that encouraged the elderly to pursue their dreams regardless of age or circumstance. Theatre veteran Yeo Hon Beng, 45, artistic director for the group, said the members incorporate their experiences and life stories into the plays. "In one of our rehearsals, we talked about marriages. The members revealed their ups and downs and how they came out better. During the rehearsals, they shared their vulnerability. We incorporated their experiences into the show." The group's upcoming production this year is an adaptation of Romeo And Juliet, with the protagonists reimagined as seniors. Ms Goh said the group wants to pose the question: Can old people fall in love? "We decided to adapt Romeo And Juliet into a silver romance because we are all seniors," she said. "We wanted to explore: If grandparents or parents got married, would their children object?" Outside of the rehearsal room at Marine Parade Community Club, the group takes on social missions in its free time. Members conduct theatre sessions for seniors, with games involved. Since 2017, the group has been performing and engaging seniors at St Luke's ElderCare Ayer Rajah Centre twice a month. Theatre games which include simple acting lines and actions are played. Mr Yeo, who has been in the theatre and film industry for 20 years, said managing a group of seniors has been inspiring and that the members are like parents and siblings to him. "I get very inspired by their energy and attitude in life. There is a lot of life experience and kinship in this group," he said. "I have a lot to learn from them and the kind of attitude they have in living life to the fullest," added Mr Yeo, who teaches drama in schools as well. For the members of Ageless Theatre, retirement from work is just an opportunity to kick-start their personal passions.